Japan's space agency (JAXA) has made history by successfully landing two robotic explorers on the surface of an asteroid. The two small "rovers", which were despatched from the Hayabusa-2 spacecraft on Friday, will move around the 1km-wide space rock known as Ryugu. The asteroid's low gravity means they can hop across it, capturing temperatures and images of the surface. "Both rovers are in good condition," the agency confirmed on Saturday. JAXA proudly tweeted pictures from the rovers, which reached Earth via the spaceship Hayabusa-2. Hayabusa-2 reached the asteroid Ryugu in June this year after a three-and-a-half-year journey. While the European Space Agency had previously managed to land on an icy comet, this is the first spacecraft to place robot rovers on the surface of an asteroid. Asteroids are essentially leftover building materials from the formation of the Solar System 4.6 billion years ago. Ryugu is a particularly primitive variety, and studying it could shed light on the origin and evolution of our own planet. How did the rovers reach the asteroid? Early on Thursday morning (GMT), Hayabusa-2 began descending towards the surface of Ryugu, preparing to eject its rovers. The little hoppers are stored in a drum-shaped container at the base of the "mothership". Collectively, they form a 3.3kg science package known as Minerva II-1. On Friday, about 60m (196ft) from the asteroid, the two robots were released. Space agency officials explained that when the front of the drum was jettisoned into space, the two rovers would be ejected from the container and fall independently to the asteroid's surface. One of the principal concerns for deployment was Ryugu's rougher-than-expected surface, which is carpeted with boulders and has very few smooth patches. What will they do there? The 1kg rovers are equipped with wide-angle and stereo cameras to send back pictures. Spine-like projections from the edges of the hoppers are sensors that will measure surface temperatures on the asteroid. They can hop and float around thanks to motor-powered internal rotors, which propel the robots across the asteroid. The diamond-shaped asteroid has a blackish-coloured surface, and rotates on its axis around once every 7.5 hours. When will they get samples? On 3 October, the mothership will deploy a lander called Mascot, which has been developed by the German Aerospace Center (DLR) together with the French Space Agency (CNES). And in late October, Hayabusa-2 will descend to the surface of Ryugu to collect a sample of rock and soil. 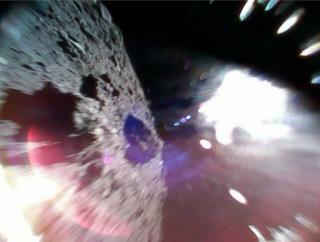 Further on in the mission, Japan's space agency plans to detonate an explosive charge that will punch a crater into the surface of Ryugu. Hayabusa-2 would then descend into the crater to collect fresh rocks that have not been altered by aeons of exposure to the environment of space. These samples will be sent to Earth for laboratory studies. The spacecraft will leave Ryugu in December 2019 with the intention of returning to Earth with the asteroid samples in 2020.